Jenna's Giveaways and Reviews: Paci Clip/Badge Reel GIVEAWAY! If you've seen practically any picture of Mr. B on my blog then you've probably noticed something that he has 99% of them time. Any guesses? Ok, ok, so it wasn't that hard to guess was it? I'm talking about paci clips. They have been a life saver. Truly. If I had to chase down every bink that Mr. B threw across the room, I'd be in SERIOUS trouble. Or I'd lose my mind. You know, one or the other. The main reason that I love these clips over the ones you can get at most stores is because of the actual clip part. It clips to the clothing without tearing it up and it's not huge like a lot of the ones on the market. What's that? You don't have a little one that uses a bink? But you work? And you have to wear a badge? I remember those days. Where I used to work you had to wear a badge just to get through all the doorways! And the best way to go about that? A badge reel. You hook your name badge to it and you can pull it out to swipe it. Then it just reels back in. Just. That. Easy. So here's how to win. There will be 2 winners - one winner for the paci clip and one for the badge reel. 1. Leave me a comment letting me know exactly how you'd like your paci clip. Go to C&C Originals Site and check out her designs. Then tell me the fabric choice, ribbon choice, initial and font (curly or large block). Be sure to give me a way to contact you if you win! 2. For another entry, blog or tweet about this giveaway (if you blog, link back to the post I wrote on my main blog about this giveaway by clicking here, if you tweet, mention @Jenna05). 1. Leave me a comment letting me know exactly how you'd like your badge reel. Go to C&C Originals Site and check out her designs. Then tell me the fabric choice, ribbon choice, initial and font (curly or large block). Be sure to give me a way to contact you if you win! I would get a chunky font, with the initial B. Except, with a "J" on it. I NEED this! I was actually just thinking today as I was swiping into my office that I need to get a badge reel. For some reason no one at my office has reels so you have to stand right next to the sensor on your tippie toes so you don't have to physically take your badge off every time you want into the offices! Anyway, I have no babies, or I would definately get a paci holder because they are so cute. I definately want a badge reel in the green zebra with an "A" in pink scrolly letters! I tweeted for an extra entry!!! LOVE the blue and white damask with the pink letter...with an H, please! Love the damask with a Pink G!!! Please pick me, my little girl needs a paci clip! Those are cute! I really like the paci clip that has the white and blue fabric with the pinks ribbon and stitching! I really liked the black with white polka dots and the pink monogram. The letter L would be great! So cute! 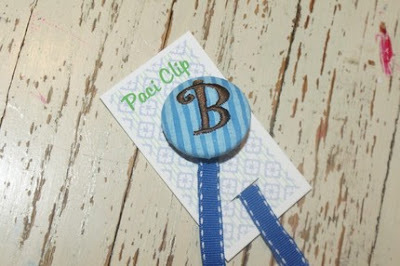 I love paci clip with the blue and white fabric with the pink curly font. I would put a J.
I like it becuase it isn't pink and brown! I'm weird when it comes to black and brown...so when Cora wears her black shoes I can't handle brown. :) This one would be PERFECT!!! 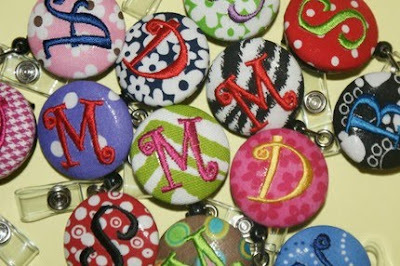 I'd love the white with blue damask with the pink curly font with a letter "G" for a paci clip. I'm due with our baby girl tomorrow (hopefully she comes soon) and I'm a germ-o-phobe so I know this will get lots of use. OH MY GOSH, as a Kindergarten teacher I could SO use this, lol! I would LOVE this one, as I'm an ORANGE freak, lol! LOVE the orange flowers, with the brown thread and initial "E". Thanks so much for this great giveaway...crossing fingers I win, lol! Have a great weekend! Ooops..my contact info is ABSees123s@aol.com! I couldn't find al the fabric choices but I love the one that is your favorite for you little man!! We could defintily use one of these!! I love the badge reels too!! I like the lime green zebra print with hot pink font!!! But with a "T" on it! Trey has all kinds of colors but we are looking for a brown paci clip. I would LOVE the badge reel. The black and white damask with a turquoise S! If I dont win I am definitely going to buy one! I would love to win the badge one! This green one with a Purple C! How cute would that be! How cool are these badge reels?! As a teacher, I could so use one. I like the orange and white small polka dot fabric with a purple M on it. Can't help it... I'm a Clemson grad! I'm an RN in the ICU and these colorful reels would add some cheer to my patients' day for sure. I'd love one that was pink! Wonder if it could say RN? If not, a K will do! How ADORABLE!!! I like the green with white flowers. Not sure what color monogramming...maybe pink?!?!? I would love to get the badge reel in the pink paisley print, green chunky CURLZ font! I'm a nurse, so this is a must have! 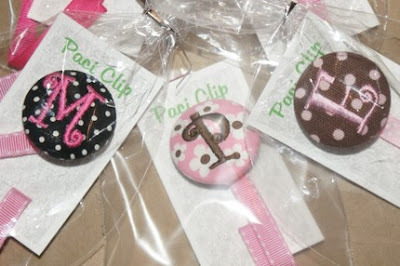 I would LOVE to win one of the paci clips - so cute!! I like the blue striped fabric with a brown H.
I love the paci clips & badge reels. I would order the clip in brown with blue dots with a blue ribbon & curly M. Very cute! How cute are these! I just looked at them and I got ripped off! I went to a children's store in Rogers and found these, but I paid a lot more for one! But these are much cuter and cheaper! WHAT!? I love all of them and I am glad you showed me her website! Thanks Jenna! Love the ones with blue and brown... for my little man! These are too cute! My sweet girl needs a new paci clip since hers broke last week! The turquoise and white clip with a pink A is my fave. I would love to win one of these for my new granddaughter who was born on the 7th! It was hard to choose just one favorite but I do like the brown paci clip with pink polka dots with the pink monogramming and pink ribbon. You always have the best giveaways! Ok..as a Pre K teacher i could GREATLY use a badge reel! I would choose the one with the brown fabric and the green/turquoise circles. I would want the curly monogram with a C on it!! I would also like chartreuse ribbon! LOVE IT! For the Paci Clip I would want the exact one that you show above. My BFF is about to have a sweet baby boy. I would want it monogrammed with an S..for Seth! Jaden is CONSTANTLY spitting out his pacifier and losing it in his car seat when we're on trips. It would be wonderful to just follow the ribbon to silence! I would love to get him the blue striped background pacifier clip with a brown chunky J. A nice blue grosgrain ribbon would look perfect! Where I work we have to wear a badge and I am tired of the tacky lanyard mine is on. A zebra print background with a pink curly K would hold up my badge quite nicely, I think! I like the lime green with white flowers, HOT pink curly Letter H.
I would want a paci clip with the purple polka dot fabric with a curly A on it and a purple ribbon. I saw the fabric as a badge reel, but I'm assuming it could be made into a paci clip too! I like the tiffany blue damask w/pink curly initial and pink ribbon. Letter C, You can contact me at aetsmith@comcast.net Thanks! !